Been using my own vegetable planting guide for some years. It shows when to make multiple sowings... they're indicated each is indicated by a sequential number. 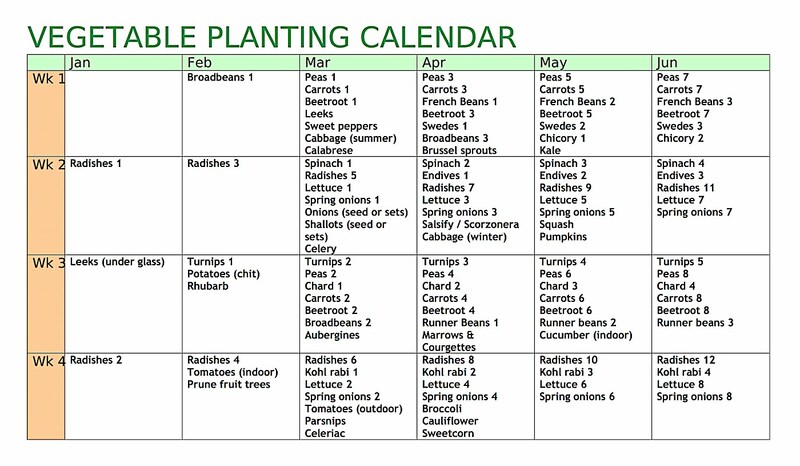 Besides the images below you can access a printable version by clicking Vegetable Planting Calendar. Hope you find it useful! Hi John its me again, Pauline, down here in London. Your vegetable calendar has become my new garden bible - so to speak. I am finding that Im following your sowing schedule week by week. Could you please, pretty please with cherries on the top :) do another chart of when each vegetable should be harvested. And when to add crop protection if needed and what type would be best. I hope you don't think I'm asking too much of you. Your chart makes so much more sense to me than anything Ive been able to find in any book. Really good guide. We live up north so do we put your planting calender a month forward to yours. Eg. If you plant in feb. Do we do ours in march? Also which gets planted under cover or in greenhouses. Hi Sheila... not sure how far north you are, but if in north of England or beyond you'll certainly struggle with the February, early March, October & November items. All the entries are for planting outside, but you could overcome some of the northern disadvantages by using a greenhouse or window ledge. You put an awful lot of hard work into this calendar and it's given me inspiration for ours this year. Thanks! A great guide, and looks very simple to follow. Could you just confirm please, are these seeds going straight into prepared outdoor sites or are they seedlings grown inside being planted out? I'm hoping to get my first allotment on Saturday....will be my first time to attempt to grow anything.Any hints and tips will be really appreciated.I'm in Cavan in the Irish Republic so our weather is pretty similar to England. Hi Geraldine... Congratulations on getting your first allotment plot! 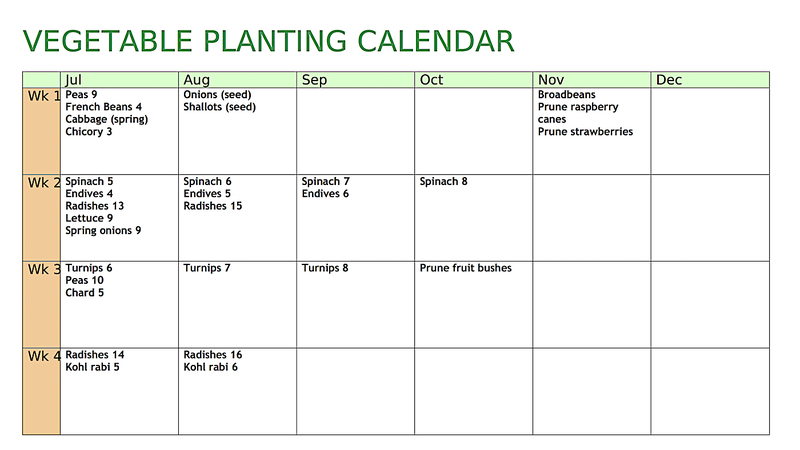 You'll find most of the items on the vegetable planting calendar are easy to grow. Just prepare your seed bed well so there's a couple of inches of fine soil. Make a small channel according to how deep the seeds need to go. Water the channel and plant the seeds sparingly. Cover the seeds so there's still a slight indent where the channel was. This means you can more easily see where to water, and the water won't run away when you do. Water lightly a couple of times a week unless it rains. And if I was to suggest one plant to start with? Would have to be tomatoes. Start growing them on a sunny windowsill. They'll be showing in a week or two and there's no bigger difference in taste than between a supermarket and home grown tomato. See the link below about how to grow tomatoes. But be careful when you plant them outside. To avoid frost damage, may be as late as end of May. I'd also get some of the longer term plants in now for harvesting next year... rhubarb and asparagus. Links to more info for these shown below also. Hi John...Thank you so much for the reply. I grew Strawberries and Tomatoes last year in containers in the back garden and had great success so will definitely grow them on the allotment.My plot will be approx 60ft x 20 ft so plenty of room..I'm just worried it may be a bit too big for me as I'm going solo on this project lol...well time will tell. Just back from viewing the allotment...it's in a beautiful spot,on a hilltop so great drainage I hope. It's all grass and weeds at the moment so my first task will be to clear this.I'm not too keen to get a rotavator as some people have told me that they can cause more problems by spreading the seeds and roots into other plots.Don't want to fall out with my new neighbours lol...was thinking of laying some membrane down over a section and working my way around the plot just using it as and when it's clear of weeds.I'm going to put aside the month of May to getting this done as I'll be working on my own so it'll be slow and steady. Slow & easy is the right way Geraldine. I used old carpets to cover the parts I couldn't get to immediately. After 6 months the soil underneath was weed free and easier to dig. Many carpet fitters are happy to get rid of old carpets and will deliver rather than take to dump and pay. Make sure the carpet is not foam backed, and your allotment site allow this. I'm with you regarding the rotavator. It will chop up couch grass roots, meaning you turn a single couch grass weed into dozens. Not helpful for worms either. Just dig a bit really well, being careful to remove all the weeds and roots. Plant in that bit so every time you come up to your plot you can see something growing. Bit by bit you'll get the whole plot under control.